Are you feeling too happy? Is your mood unacceptably elevated? Are you experiencing a sensation of optimism over the nature of humanity and the future of our environment? Well let me fix that for you. Seanetter Dan Tracey went out for his walk on Salisbury Beach State Reservation in Massachusetts last month. 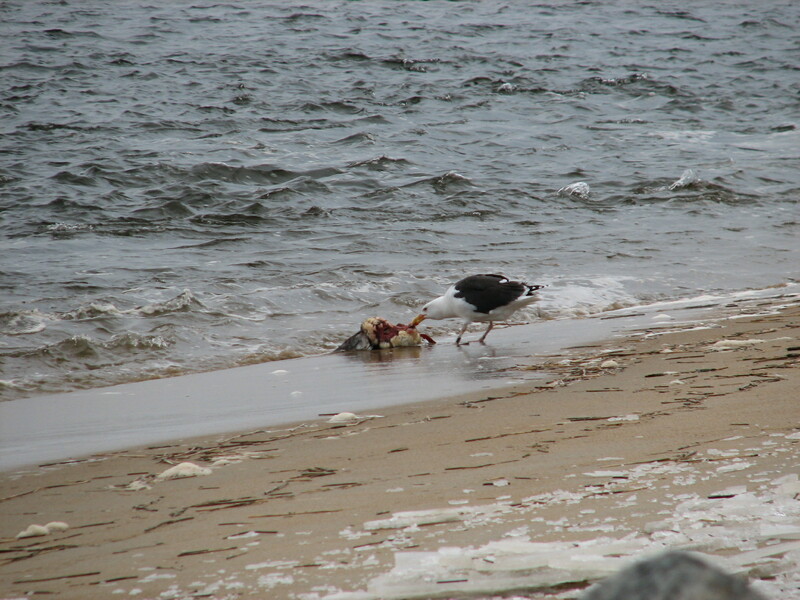 At the waterline, he saw a Great Black-backed Gull tearing into a fresh carcass. Turns out, that gull had been banded by Dr. Julie Ellis, but it flew off before Dan could get its i.d. As he approached the now abandoned dead bird, he found it to be a gorgeous male Red-breasted Merganser. On closer inspection, he found the depressing part of the story: a hair elastic was wound around the lower bill and head of the duck, rendering him unable to eat. Presumably, he starved to death, ending up as a meager and interrupted meal for that banded gull. I sometimes incur the amused or irritated dismissal of friends when I talk about the impact of balloons released into the air, or plastic bags discarded by the road. 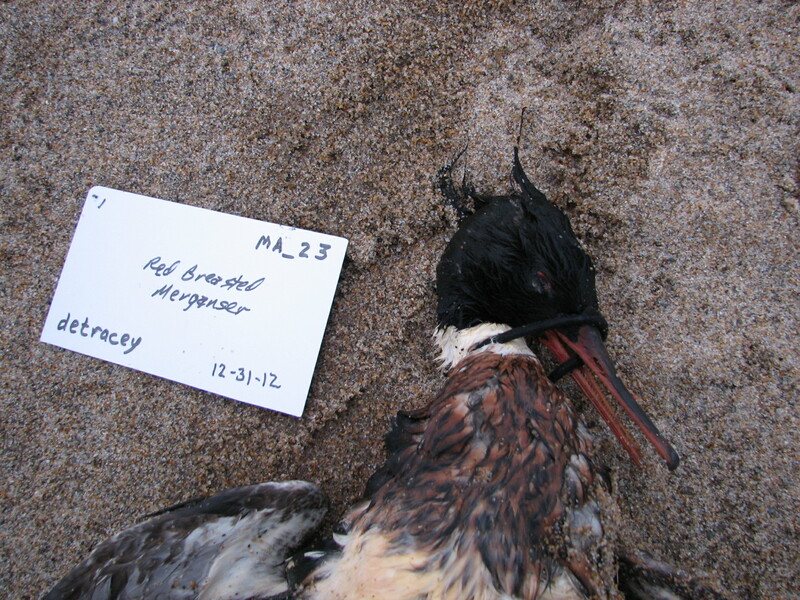 Most things find their way into the oceans, and this dead bird is only one of many suffering lethal impacts from seemingly insignificant bits of human trash. People may dismiss our pleas, or laugh off the issue, but I am hoping that pictures like this one will affect at least some folks out there. The birds we find dead like this are only a small fraction of the birds that die, so I assure you, this is a big issue. The solemn lesson this bird gives us: Keep track of your crap, everyone! And spread the word far and wide! Why can’t we get signs posted at all bay and oceans beaches informing people of the dangers of leaving balloons, etc on the beach?! I do not understand why this is not possible! People talk of throwing things ‘away’. There is no ‘away’. There is only putting it in another place or transforming it into something else. The time to think about your trash is when you buy it – what will you do with it when you’re done? where will it go next? I regularly photograph and pick up trash along the shoreline, sometimes seeing the untoward and tragic effects on animals. But, this is the first time I’ve seen a hair elastic as lethal weapon. How terribly sad, I admit to some tears upon viewing these images. Your post is a sober and critical reminder about considering every single thing we use. As Jamaica Footnote writes. There is no “away.” I was speaking to someone the other day who said, “I don’t understand the plastic bag bans. It’s not like I’m throwing my bags in the ocean.” Thank you for documenting this because there’s obviously still a huge gap between reality and understanding. Absolutely. It’s often hard to get people to understand the real world consequences of our trash when it is diverted from the waste stream. Like many of you, I will continue to try to drive home that point, using these sad and striking images. Thanks for reading and commenting here!